Welcome to the Wonderful World of SewEzi! The Portability and Versatility of our products help incorporate sewing into your busy lifestyle. 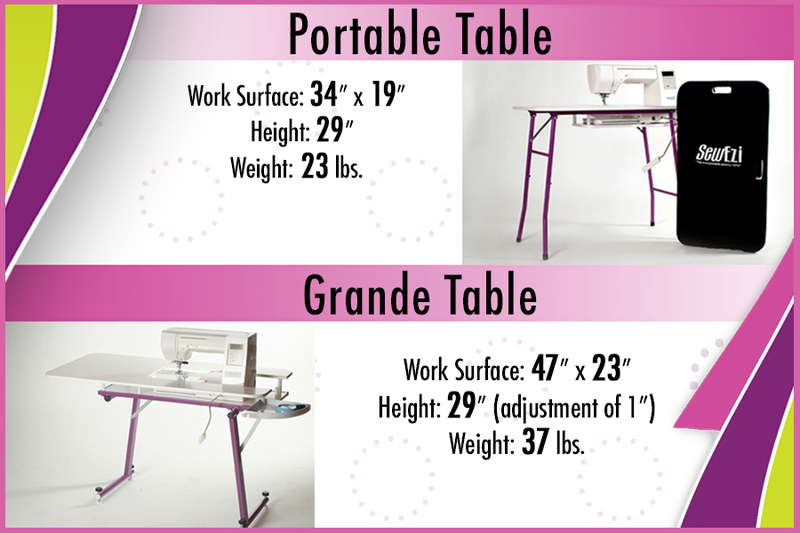 SewEzi portable sewing tables are designed to create a better sewing experience. Our tables provide a personalized workstation where you can complete your quilting and sewing projects. SewEzi sewing tables have the added advantage of being able to be packed away when you need additional space. The SewEzi Portable is ideal to take to retreats and classes, and the Grande is a relocatable sewing and quilting table designed for your sewing room. The SeweEzi Tables are engineered for optimal stability . Portable: The legs are flared out at the bottom and the weight of the machine is centered in the table. These two elements create optimal stability. Grande: Features a heavy duty steel leg frame and has the machine centered in the table to create optimal stability. The SewEzi portable table folds up into a carrying case and has handles and wheels on it so you can take it to classes and retreats. At 23 lbs., this lightweight design also contributes to the ease of transportation. Both SewEzi Tables have a series of accessories to customize your table to your needs. Check out our accessories here! If all of these features weren’t enough to get your attention, the SewEzi table is reasonably priced. This product is not sold in retail stores. We offer it directly through our website in order to bring it to you at the lowest possible price. Still have questions about our products? Check out Our Products page or our FAQ page.